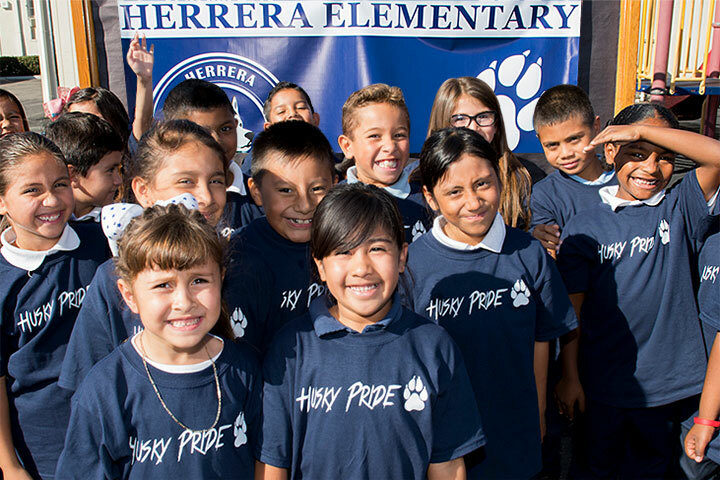 Olivia Nieto Herrera Elementary School, formerly Lee Elementary, dedicated its campus in honor of the school’s new namesake last week to the cheers of students, staff, parents, community leaders and members of the Nieto Herrera family. Olivia Nieto Herrera was an educator and highly respected advocate for disadvantaged families. She established Centro Shalom, which provides support – including food, housing, clothing and legal aid – to families in the neighborhood surrounding the school. “She loved children, and everything she did was for the betterment of the people around you,” Amelia Nieto, daughter of Olivia Nieto Herrera, told the student body during a bright fall morning on the school playground. Daughter Amelia led the student body in a chant of the phrase “Sí, se puede” (Spanish for "Yes it can be done,” the motto of the United Farm Workers and Cesar Chavez). She encouraged the students to repeat the phrase once more, loudly. “Sí, se puede!” the students shouted. The Long Beach Unified School District Board of Education decided in July to rename Lee Elementary School in honor of Olivia Nieto Herrera. The school’s new name became effective Aug. 1. The renaming ceremony included the recitation of a student poem and the “Husky Pride Cheer” based upon the school’s newly chosen mascot. Students sang “We Are the World” and heard words of encouragement from Congressman Alan Lowenthal, Board of Education Member John McGinnis, LBUSD Superintendent Christopher J. Steinhauser, LBUSD Assistant Superintendent of Elementary Schools Brian Moskovitz and the school’s principal, Christi Granado. RENAMED SCHOOL – Students at Olivia Nieto Herrera Elementary School (formerly Lee Elementary) celebrate the school's renaming. The new name comes with a new mascot, the huskies instead of the lions.